New Zealand is a small but incredibly beautiful country that sits like a semicolon at the end of the sentence that is Australia. (Yes, that's a transportation joke. If you don't get it, don't worry; it wasn't all that funny.) 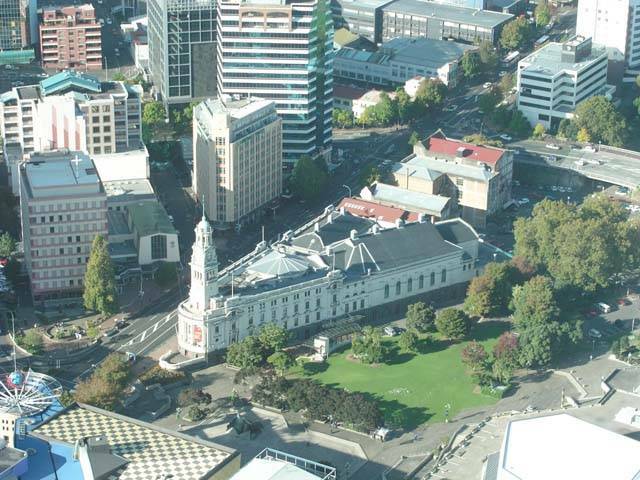 Two big islands with roughly the land mass of California, it has one tenth the population, about a third of which resides in the greater Auckland area. Major industries include sheep, dairy cattle, timber, fruits, vegetables and just about anything that else that will grow here. It is home to three kinds of Kiwis: the bird kind, which hides away during the day and can only be seen in animal parks; the fruit kind, which they foolishly permitted to grow in other parts of the world; and the people kind, who may just be the nicest and friendliest on the planet. So what, you may wonder was I doing in New Zealand? Credit my visit to two unrelated events. The first was the release of the extended edition DVD of Lord Of The Rings: The Fellowship Of The Ring, the one with the four commentary tracks and five hours of documentaries. By the time I'd watched the film for the third time, my desire to see the country that passed for Middle Earth was well nigh irresistible. The second event was my employer's decision that they could do without my services, a situation which I accepted with as much grace as I am capable of mustering. So, with time on my hands while I began the search for a new gig, I decided it was an excellent time for an adventure. And a little while later I was on my way to a month-long wander through the land of Xena and Hercules and Peter Jackson. 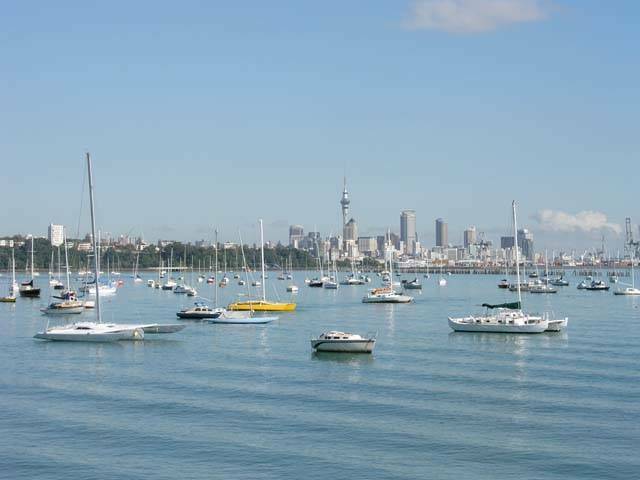 I arrived in Auckland in the dark, missing my first chance to see something of the country as I waited for the sun to catch up to my body's concept of daytime. I'd have all of a day here before heading north. So I started walking, trying to get whatever impressions my sleep-deprived brain could absorb. 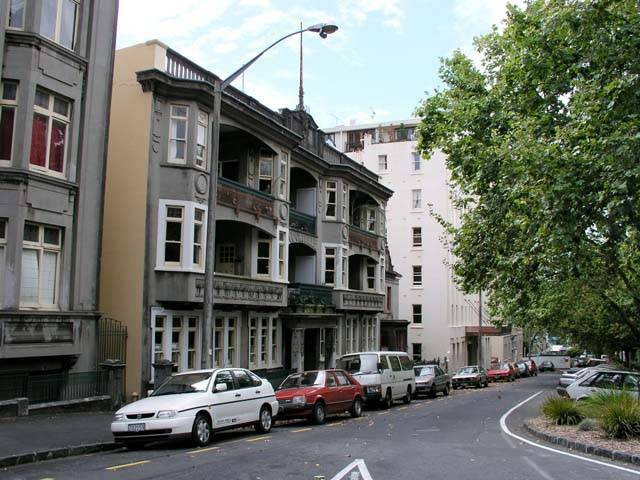 My first discovery was that Auckland is remarkably hilly, a result of its location on and around a series of volcanic cones. Extinct cones, I can only hope. Centre city was all shops and office buildings, mostly deserted at seven on a weekday morning. But after a while I found more interesting architecture. Like the High Court building at left, carefully set back from the street and the sidewalk as if in anticipation of my photographic requirements. Or the house fronts in the next street over, named Courtville I can only guess in honor of its proximity to the halls of justice. The court looked clean and bright and perfect; Courtville a little more worn and lived in. Not sure which I like better. I didn't see much of the city that first day. 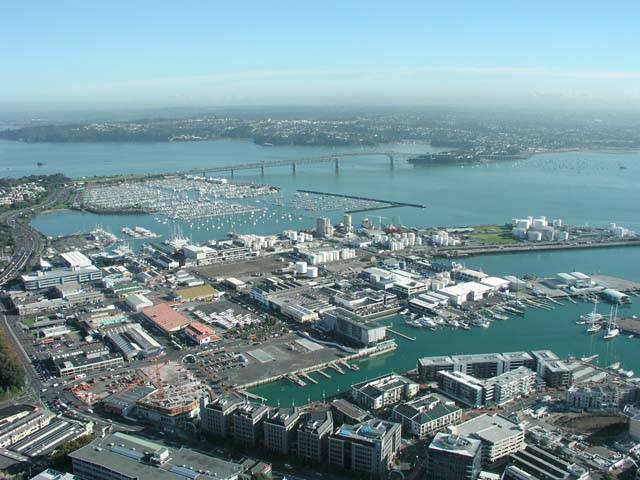 But not being one to let a lack of information intrude on a good assessment, I decided that Auckland was an uninteresting place, a poor second to harbour cities like Sydney and Rio and my own San Francisco. I was, as it turns out, full of it. I wouldn't discover the folly of my snap judgment for three more weeks, when I returned to Auckland at the end of my trip. Now I would have the chance to explore properly. Even better, I now had at least some concept of what it was I'd be seeing. Context is a useful thing. I began my day at the Sky Tower, an observation platform that rises a thousand feet from the lobby of my hotel. (How's that for convenience?) From the upper platform, I got good views of the Harbour Bridge and the marina where two Americas Cup challenges were fought, as well as the wedge-shaped Town Hall, a graceful Victorian structure that stares contemptuously at the globe of Planet Hollywood across the street. The Sky Tower advertising announces proudly that it is the tallest structure in the Southern Hemisphere. That's a phrase you hear a lot in New Zealand: tallest/biggest/richest in the Southern Hemisphere. Really what they mean is: "better than anything the Ozzies have". 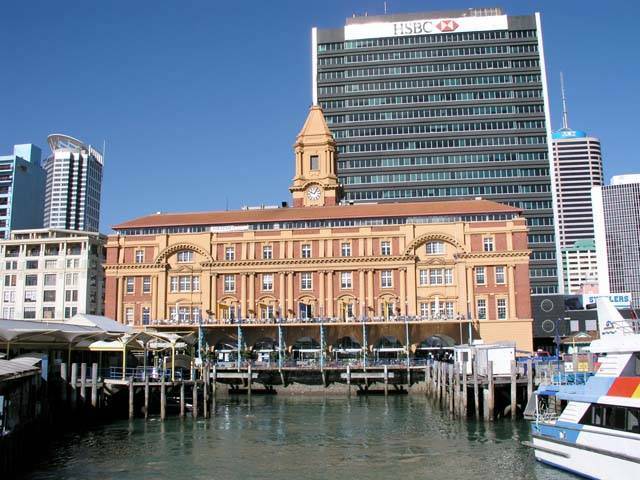 Back at ground level, I went in search of the Auckland Explorer, one of those tourist buses that stops at all the city's must-see spots. First on the agenda was Kelly Tarlton's Antarctic Encounter & Underwater World. 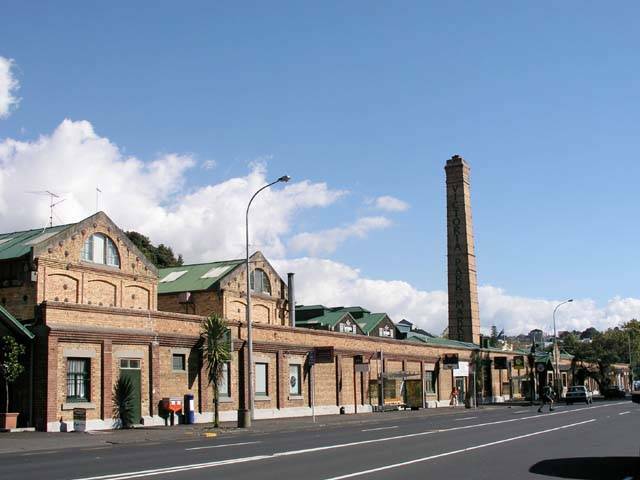 Underwater and underground; at street level there's a fine view of the harbour and the city, a parking lot and an entry to what were built as storage tanks for rainwater. 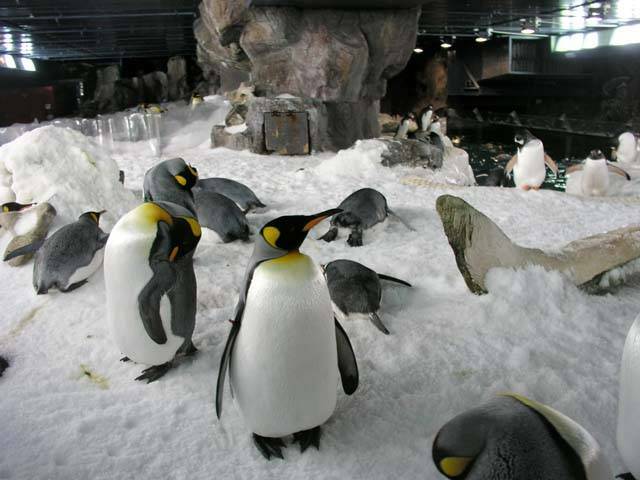 But now those tanks hold a replica of Scott's Antarctic base, a Snow Cat ride through a penguin habitat and a moving sidewalk where you are surrounded at left, right and above by sharks, stingrays and way too many different species of fish. If only the lighting had been a little better, I'd have a lot more pictures. For some reason, fish and birds don't take kindly to having bright lights flashed into their eyes. 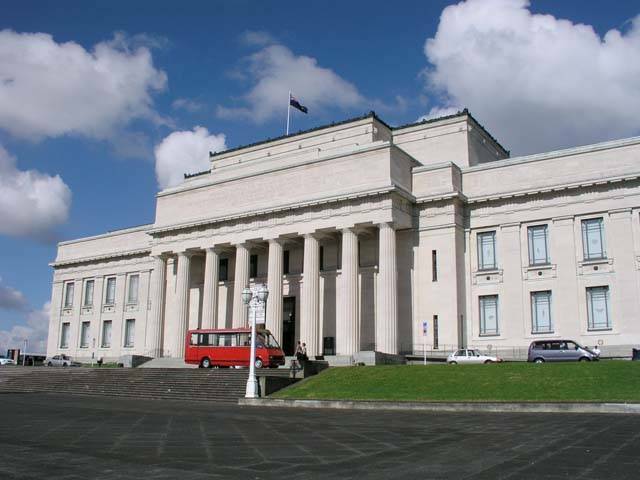 My next stop on the tourist bus was the magnificent Greek revival building that houses Auckland Museum. 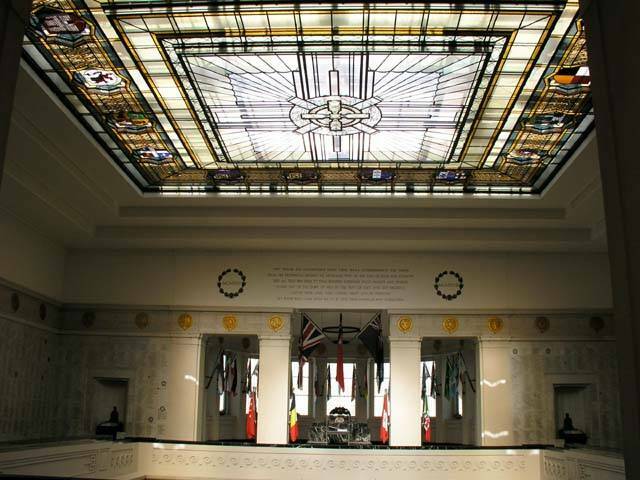 Officially it's the Auckland War Memorial Museum, built in 1929 to commemorate the end of the First World War and expanded later to honor all the other Wars To End All Wars. 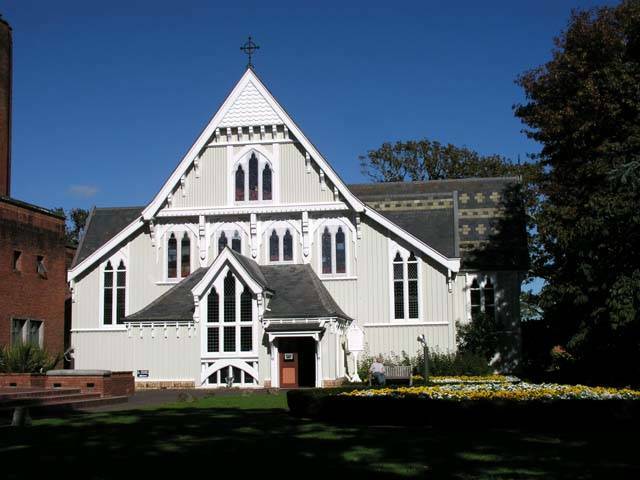 In addition to the memorials to those New Zealanders lost in the wars, the museum has wonderful exhibits on local flora and fauna and artifacts from the country's Polynesian and European cultures. 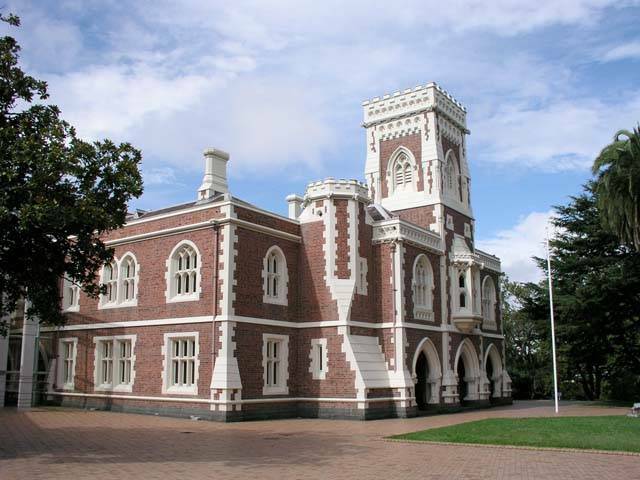 But the museum is worth seeing just for its architecture and its views over the Domain, Auckland's oldest and largest park. No grand estate envisaged by Jane Austen could be more happily situated than this. 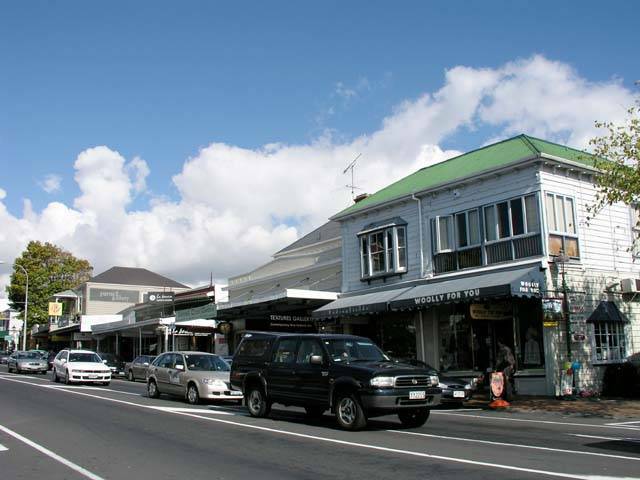 Just up the road from the museum is the town of Parnell, reputed to have good places to eat, interesting shops and some historic buildings. The bus let me off in front of the Höglund Glass shop where I relieved myself of a few more dollars before checking out the rest of the street. And up the street a little way I had a little brush with Lord Of The Rings. A sign in front of a small clothing shop advertised itself as weavers for the film. The woman inside explained that the cloaks given to the Fellowship by Galadriel were woven on hand-operated looms. And no modern dyes either; the wool for these garments came from a very special flock of grey sheep. I was fascinated by the lengths the filmmakers went to preserve the illusion; no cutting corners for these guys. But much as I wanted a cloak like Frodo's, I just couldn't bring myself to spend $1000 US on such a garment. I settled for a throw rug of the same material, a memorable souvenir both of New Zealand and Middle Earth. From Parnell Village I wandered up the hill to get a closer look at St. Mary's Church. I'm not normally interested in houses of worship, but St. Mary's is kind of special. 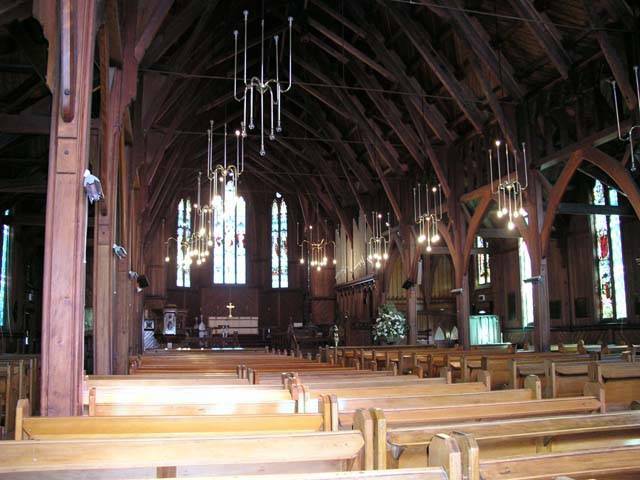 Built of native kauri and rimu, it is reputedly the best wooden church in the country. Much warmer and friendlier than the brick cathedral next door. Which wasn't always next door; two decades ago St. Mary's was put on rollers and moved across the street to its present location. Which raises an interesting question: Why did the church cross the road? Kiwis seem to have taken up recycling long before it became fashionable in my corner of the planet. Kelly Tarlton's reuse of those old water tanks for his aquarium is just one example; here are two more. Victoria Park Market at left is a tourist-oriented shopping mall that began life as a rubbish incinerator. What was once a place to drop off all the crap you have no use for is now a place to pick up all kinds of new crap you have no use for. 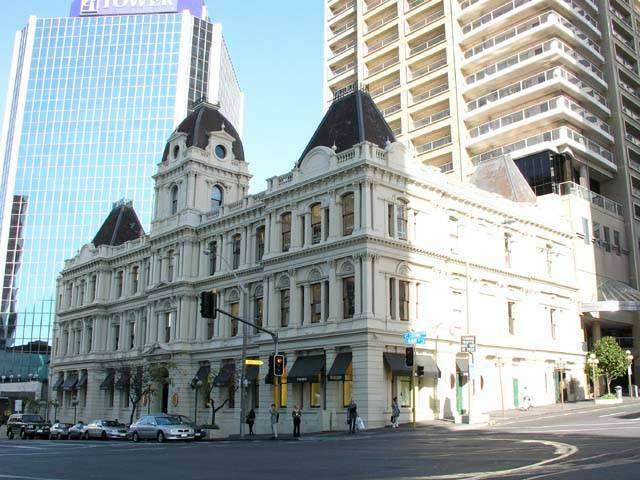 At right is the former Customs House, now the city's biggest duty free shop. So instead of paying duty, you go there to avoid paying it. Gee, talk about irony! On my last day before heading home, I decided to wander over to the Ferry Building. My destination was Devonport, across the harbour to the north. Back before there was a Harbour Bridge, Devonport's car ferry terminal was the main gateway between the northern suburbs and town. 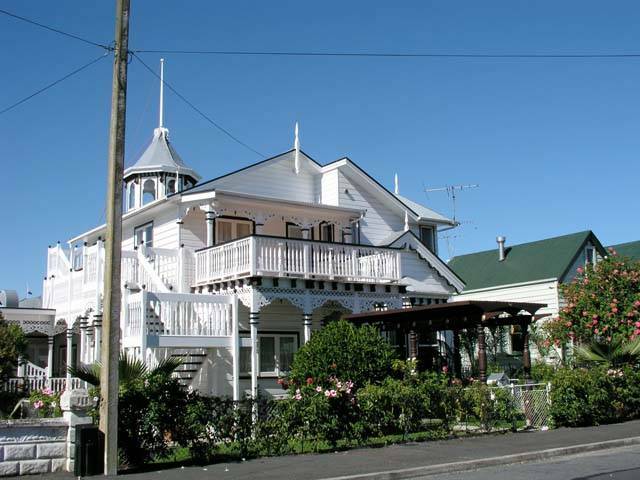 These days it's quieter and more relaxed, just a nice suburb full of handsome Victorian cottages and flowers and some splendid views of Auckland from the tops of its volcanic cones. And all just a pleasant boat trip from downtown. 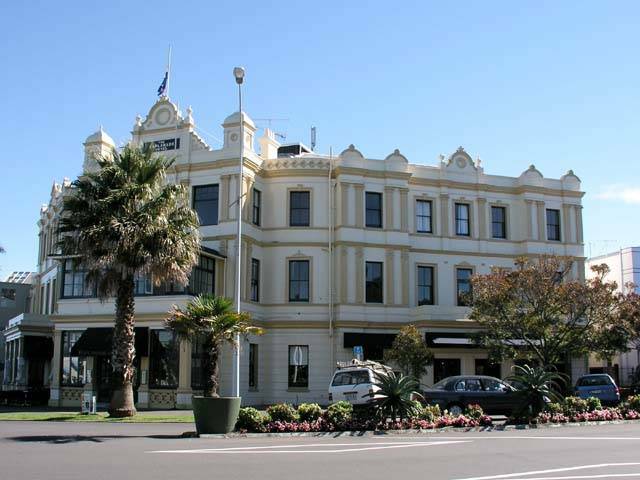 The Esplanade Hotel greets you as you step off the ferry, a grand Victorian that wouldn't look out of place at Brighton or any of those other places where Brits go to get some sun. (Or more likely to rust, English weather being what it is.) 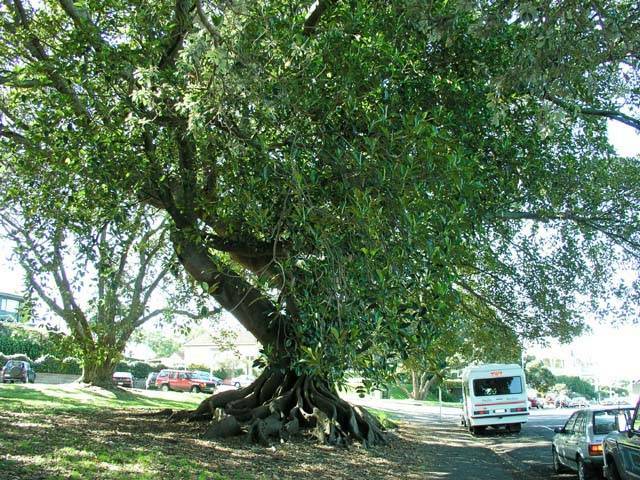 And around the corner are some magnificent old trees, like the Moreton Bay fig tree at right, an import from Australia that has the most impressively bizarre root structure I've ever seen. The base looks more like a set of channels for marble races than anything designed to support a tree. Submitted for your approval: the bronze plaque at right, adorning an ordinary looking wall on an ordinary Devonport street. Part of the fun of wandering a new place is looking for something just the tiniest bit interesting or peculiar, the kind of thing another, less dedicated tourist might miss. Like this seemingly unassuming bit of wall. But looks often deceive. 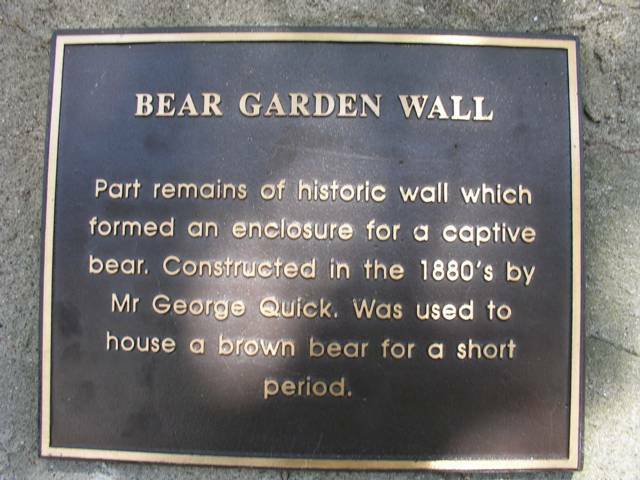 This is a historic wall, one that once served to house a bear. Don't you feel better for knowing that? This is just the sort of history you just don't get from your typical guidebook.